VECTRA22 Features: -Use on fabric, furniture, rugs, wall coverings, suede and porous leathers. -Protects against stains like coffee, tea, wine, grease, food and pet stains. -Repels stains without affecting fabric breathability. -Non-aerosol spray. -Contains no fluorocarbons and is non-toxic and environmentally safe. -Capacity: 12 Ounces. Purpose: -Furniture/Carpet. Style: -Sprayers. Use: -Automotive/Garage/Living Areas. Scent: -Unscented. Chemical Size: -10 - 20 ounces. Pack Size: -Individual. Product Type: -Protectants. Country of Manufacture: -United States. Dimensions: Overall Height - Top to Bottom: -7.9". Overall Width - Side to Side: -2.75". Overall Depth - Front to Back: -2.75". Overall Product Weight: -0.75 lbs. 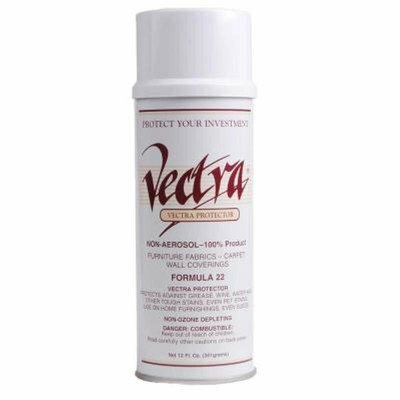 If you have any questions about this product by Vectra, contact us by completing and submitting the form below. If you are looking for a specif part number, please include it with your message. Swiffer Furniture Polish, Citrus Scent, 9.7 oz Spray Bottle - six cans of furniture polish.